We’ve all had times—business trips, moving houses–when we felt we were “living out of a suitcase”…but Natalie Sisson actually works out of one! She travels the world, running her business with just a laptop and some really good wifi, and her office is wherever she parks her suitcase. That’s how she came to write THE SUITCASE ENTREPRENEUR, the bestselling book that teaches you how to establish a business online, reach a global audience, and build a virtual team to give you more free time, money, and independence. 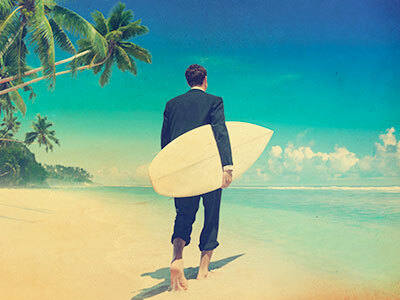 Not only are these tips helpful for the businessman/woman on-the-go, Sisson offers great travel advice for those who are looking dip their toes in the sand and recharge from a stressful work season. Grab your pina colada and learn how to navigate travel and accommodation like a pro. There is no shortage of tools and services to book cheap flights and accommodations, all designed to help travelers and entrepreneurs travel smarter. However, it can get overwhelming, so I suggest you stick to using the best of the best, and cut out the rest. To get you started, I highly recommend you refer to the following two websites first, to plan your travel and then use the tools to book your flights listed below to actually book your trip. In my opinion, TripAdvisor is the most useful tool for any traveler. It gives you fantastic information about cities, countries, hotels, food, accommodations, and activities. Before you do anything, open up a tab on your browser for TripAdvisor. Then cross-reference anyplace you’re thinking of booking into against the ratings and reviews of thousands of travelers before you make your decision. Create an account with TripIt and download the TripIt Pro application for your smartphone. It’s a super simple way to organize all of your arrangements in one place. The app organizes accommodations and travel details into easy-to-see itineraries, and if a flight is delayed or a gate changes, it informs you by text or e-mail. There are endless websites and services to book your travel. But if you really want to get savvy, then depending on your needs, choose from the three options below. I personally use a mix of all three. My go-to tool of choice to book a flight is Skyscanner.net, which is a great DIY aggregator of all the flight options across hundreds of airlines. Rather than opening up several browsers to search their travel aggregators, you just get one search result. What I like most is its accuracy. While I always advise you to check the local airlines in the country you’re in to see if they have a better deal, nine times out of ten, Skyscanner has found this for you. I also like the Everywhere option if you want to see where you can fly to anywhere in the world. They also have a mobile app in which you can save your favorite searches. Two other options are Hipmunk and airfare watchdog. If you really don’t have much time or inclination to search through results and book everything yourself, then outsourcing to flight search engine Flightfox is going to be right up your alley. You pay a fee, starting at $24, and experts track down cheap flights for you. It’s like having a really travel-savvy virtual assistant do all the work for you. To get the best prices, you should do a quick search on Skyscanner first so that the Flightfox agents have a price to beat. I still think booking through a travel agent is a great option, particularly if you have a more complex itinerary in mind. They can do all the legwork for you, especially on round-the-world trip tickets and packages, and you can sit down and ask them a ridiculous amount of annoying questions. Their fee is usually built in, and if you compare the price to your hourly charge, it’s most likely worth the money. Flight Centre is renowned for being an international travel agent with a great reputation. At a pinch, call the airline directly, as the few agents that are still employed are seasoned veterans with a wealth of information and often have tricks that save you money. They have access to all inventories and often can work their magic to make the impossible possible. Once you’re done with all the flight bookings and accumulating your reward points to travel virtually for free, then make sure you check out and install the following apps for a smooth journey, or find your own in the Apple store or Google Play that have great reviews and ratings. Airport Transit Guide is a traveler’s complete guide to some 460 airports around the world, covering just about all the options for airport access – taxi, bus, rail, and shuttle – with fares, travel times, and pickup points, allowing you to make informed comparisons and money-saving decisions. GateGuru will help you navigate through unfamiliar airports so you’re not left running to your gate. For more great advice about travel, running your own global business, and where to find free wifi, pick up THE SUITCASE ENTREPRENEUR, available from North Star Way books. 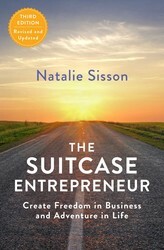 Visit Natalie at https://suitcaseentrepreneur.com/. Now in its third edition, The Suitcase Entrepreneur teaches readers how to package and sell their skills to earn enough money to be able to work and live anywhere, build a profitable online business, and live life on their own terms. With new material pertinent to today’s business world, readers will receive the blueprint to create their ideal lifestyle and become their own digital nomad.After eight years of working in the soul-crushing bureaucracy of the corporate world, Natalie Sisson quit her high-paying job and moved to Canada, started a blog, and cofounded a technology company. In just eighteen months she learned how to build an online platform from scratch, and then left to start her own business—which involved visiting Argentina to eat empanadas, play Ultimate Frisbee, and launch her first digital product. After five years, she now runs a six-figure business from her laptop, while living out of a suitcase and teaching entrepreneurs worldwide how to build a business and lifestyle they love. In The Suitcase Entrepreneur you’ll learn how to establish your business online, reach a global audience, and build a virtual team to give you more free time, money, and independence. With a new introduction, as well as updated resources and information, this practical guide uncovers the three key stages of creating a self-sufficient business and how to become a successful digital nomad and live life on your own terms.